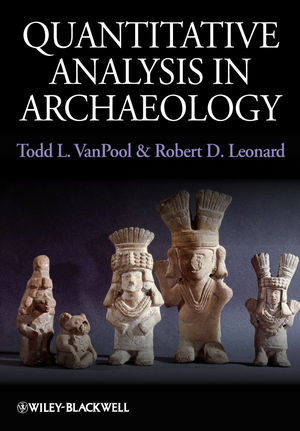 Quantitative Analysis in Archaeology introduces the application of quantitative methods in archaeology. It outlines conceptual and statistical principles, illustrates their application, and provides problem sets for practice. Todd L. VanPool is Assistant Professor at the Department of Anthropology, University of Missouri, Columbia. He is the co-author with Christine S. VanPool of Signs of the Casas Grandes Shamans (2007), Religion in the Prehispanic Southwest (2006) and Essential Tensions in Archaeological Method and Theory (2003). Robert D. Leonard is retired from the Department of Anthropology, University of New Mexico, Albuquerque, where he taught for 17 years. He is currently the co-owner and a project director of Human Inquiry, a consulting firm that uses an interdisciplinary anthropological approach to help improve building designs. The relationship among the scales of measurement. Displaying Data like a Pro. Archaeology and Exploratory Data Analysis. 4 Characterizing Data Numerically: Descriptive Statistics. Which measure of location is best? Calculating Estimates of the Mean and Standard Deviation. Characterizing Nominal and Ordinal Scale Data. Index of dispersion for nominal data and the index of qualitative variation. 5 An Introduction to Probability. Using Probability to Determine Likelihood. 6 Putting Statistics to Work: The Normal Distribution. 7 Hypothesis Testing I: An Introduction. Formal Hypothesis Testing and the Null Hypothesis. 8 Hypothesis Testing II: Confi dence Limits, the t-Distribution, and One-Tailed Tests. Comparing Sample Means to m.
Statistical Inference and Confidence Limits. Degrees of freedom and the t-distribution. Hypothesis Testing Using the t-Distribution. 9 Hypothesis Testing III: Power. Increasing the power of a test. Calculating Power: An Archaeological Example. Putting it all Together: A Final Overview of Hypothesis Testing. 10 Analysis of Variance and the F-Distribution. Model II ANOVA: Identifying the Impacts of Random Effects. Model I ANOVA: The Analysis of Treatment Effects. A Final Summary of Model I and Model II ANOVA. Identifying the Sources of Signifi cant Variation in Model I and Model II ANOVA. 11 Linear Regression and Multivariate Analysis. Evaluating the Statistical Significance of Regression. Using Regression Analysis to Predict Values. Placing confi dence intervals around the regression coefficient. Confidence Limits around Y for a Given Xi. Some Final Thoughts about Regression. Selecting the right regression model. Do not extrapolate beyond the boundaries of the observed data. Use the right methods when creating reverse predictions. Be aware of the assumptions for regression analysis. You may be able to transform your data to create a linear relationship from a curvilinear relationship. Use the right confi dence limits. The assumptions of Pearson's product-moment correlation coeffi cient. Spearman's Rank Order Correlation Coeffi cient. Some Final Thoughts (and Warnings) about Correlation. Determining the Source of Variation in a Chi-Square Matrix. The Analysis of Small Samples Using Fisher’s Exact Test and Yate's Continuity Correction. 14 An Abbreviated Introduction to Nonparametric and Multivariate Analysis. Multivariate Analysis and the Comparison of Means. A review of pertinent conceptual issues. 15 Factor Analysis and Principal Component Analysis. Objectives of Principal Component and Factor Analysis. Designing the Principal Component/Factor Analysis. Assumptions and Conceptual Considerations of Factor Analysis. An Example of Factor Analysis. Factor Analysis vs. Principal Component Analysis. 16 Sampling, Research Designs, and the Archaeological Record. How to Select a Sample. How Big a Sample is Necessary? Appendix A Areas under a Standardized Normal Distribution. Appendix B Critical Values for the Student's t-Distribution. Appendix C Critical Values for the F-Distribution. Appendix D Critical Values for the Chi-Square Distribution. Appendix E Critical Values for the Wilcoxon Two-Sample U-Test.